We are looking for special people who feel they can open their homes to fostering a Newfie. We URGENTLY need people to come forward as without foster homes we have nowhere for them to go while an appropriate adoption can be put into place. 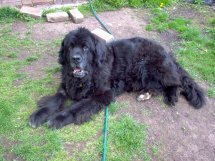 This page is dedicated to Newfoundlands that have come through The Northern Newfoundland Club Welfare Scheme and have found their forever loving homes. Harry, was a 12 year old welfare Newfoundland who was adopted by the Northern Newfoundland Club. His life had not been a particularly happy one. He was used as a stud dog on a puppy farm and his name appears on a lot of pedigrees of puppy farmed dogs. 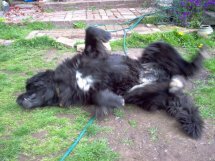 Harry was mated to Newfies, St Bernards, Pyreneans and any other breed unfortunate enough to be owned by his unscrupulous owner. He was kennelled in appalling conditions for many years and it was only when he had outlived his usefulness for breeding that he was rescued by an animal sanctuary in West Wales. At this point Harry was very depressed and extremely underweight (48 kilos) with large sores on his skin. Fortunately the sanctuary contacted Jenny Davie and Sandie Sharpe who have huge experience in both helping and rehabilitating rescued Newfoundlands. It became a matter of urgency to secure his release, and Jenny and Sandie soon took him home with them. It was obvious that Harry desperately needed help and in spite of the attitude of certain uncaring people who thought he should have been left in kennels because he had never known anything different, Jenny and Sandie set about giving him some quality of life. For the first time Harry had a garden to roam in, a beach to walk on, and a fire to sit in front of. He also had people who would care for him, and he revelled in the affection he has been denied all his life. Unfortunately it quickly became apparent that Harry had a major stomach problem which required veterinary attention. Abdominal Surgery followed. This revealed that his stomach was full of 2 kgs of stones, nails and screws. The vet was convinced that he had eaten this material in an effort to assuage his hunger. This was proof that Harry had been starved at the puppy farm. Harry soon became a much happier dog, but he was unfortunately diagnosed with pancreatitis linked to a pancreatic tumour. Again he was hospitalised and put on a drip which greatly improved his condition allowing him to go home again with Jenny and Sandie. Jenny and Sanie knew that his time was limited but while he had good quality of life he deserved the very best. The Northern Newfoundland Club took Harry under their wing, and accepted responsibility for meeting his veterinary bills. The club made sure that Jenny and Sandie had all the support they needed to keep him happy and pain free. In May 2010, Jenny & Sandie had to make the terrible decision to let Harry go to Rainbow Bridge after an episode of bloat. He was brought home but unfortunately started to deteriorate so the vet was called and Harry went to sleep in his favourite bed. R.I.P. Harry - a very special boy. Harry is one of many unfortunate dogs that need help from Welfare. 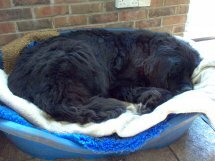 Not all Newfoundlands have the luxury of a caring home with loving owners - some are isolated, unloved, neglected and even abused. 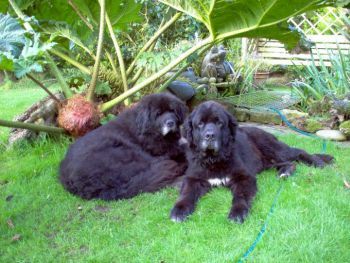 As with any breed Newfoundlands sometimes need rescue or rehoming. However, because of their size and special needs the process is especially demanding with Newfoundlands. The need for rehoming often arises as a result of a marriage breakdown, changes in housing or employment or other unforseen circumstances. If for any reason you are no longer able to look after your Newfoundland we urge you to contact us for help.